Most patients who are considered for the transplantation waiting list want to know how long they'll have to wait. To truly understand the answer to this you have to be both a doctor versed in the world of HLA matching and homozygosity, and a statisician. That's why they use a computer model! For those clever enough to understand this we include all the base material from the transplant authority (most recent data for the year 1 April 2012 to 31 March 2013). We will summarise the rest for everyone else. However a huge "health warning" should accompany this. Individual circumstances will affect the answers in your case. Can I get on the list. When I'm on the list, how long will it be before I receive an organ. When I received a kidney, how long will the graft last? But before we get to these a brief look at organ transplantation in general. Organ transplantation (most recent data for the year 1 April 2012 to 31 March 2013) continues to be dominated by renal transplantation. 87% of patients on the waiting lists were waiting for kidneys (and/or another organ such as a pancreas). The report states. "As the total number of deceased donors and transplants continued to increase this year, the number of patients on the active transplant list at 31 March 2013 is 304 less than on the same date last year. This drop reflects an increasing number of transplants performed and a reasonably steady number of patients joining the transplant list each year. 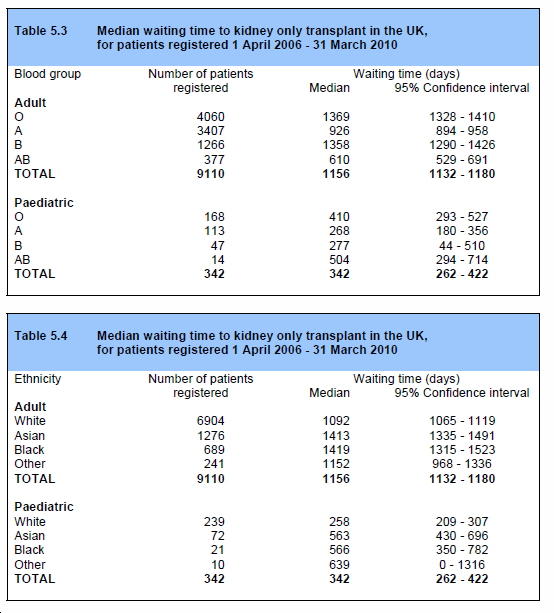 The increase in donor and transplant numbers (1 April 2003 to 31 March 2013) and the number of patients registered on the transplant lists at 31 March each year are shown in Figure 2.1. There were 206 more deceased donor transplants in 2012-2013 than in the previous year, representing a 7% increase. The corresponding increase in the number of deceased donors was 11%." Can I get on (and stay on) the list? Exposure to viral infection (blood) test to look for the presence of viruses ranging from HIV to glandular fever. A general fitness test to screen for cardiovascular risk - walking at an increasingly brisk pace on a "gentle" uphill treadmill for up to 7 minutes while attached to equipment to monitor your heart. There is no absolute cut off for over-weight patients. However anyone with a body mass index above 30 has a greater risk during surgery and of post-operative problems with the graft. They look for other co-morbidities (other serious diseases) that might prevent a successful transplant such as cancer or lung disease. Finally the consultant transplant surgeon will look at your test results and decide whether you should be put on the register (waiting list). In the subsequent months you will need to supply further repeat blood samples that continue to look for viruses as well as the level of antibodies in your system. If you fall ill with flu or a more serious illness you will be suspended from the list until you recover. You will also be taken off the list temporarily if you go on holiday outside the UK. When I'm on the list, how long will it be before I receive an organ? The simple answer is it depends...or maybe...it's complicated! Typically you wait longer if you are black or south Asian, due to a lack of suitable donors. 20% of patients on the list are from these communities but only 2% of donors are. If you have higher levels of antibodies or a rarer blood group this complicates things further. So the waiting times are slowly decreasing due to the number of live and deceased donors coming forward and this is greater than the number joining the register. Note: ​a confidence interval (CI) is a measure of the reliability of an estimate. So a 95% CI is the range within which you would expect 95% of the patients to be found. The median is the number which separates the higher half of the sample from the lower half. So here half the patients will wait less time than the median, the other half longer. The time you wait is based on an algorithm that generates a points value. The higher the points value, the higher you are up the waiting list (register). Children and young adults are given priority if a matched donation becomes available as they will most likely gain a long-term benefit from donation. Paediatric patients are prioritised within Tiers A and B according to waiting time. HLA match and age combined - is a formula make sure the kidney goes to a good match for tissue and age. If you are under 55 you get more points than over. Donor-recipient age difference - points are given for closely matching donor and recepient ages. It is difficult to summarise most of the rest of the policy. But when you read the document you realise that time on the register is only part of the wait. If you wait the median time for a white male you accrue 1092 days/points. If the kidney is harvested in your centre you get 900 points and there are many other factors. So you can see that time on the list does not dominate the selection criteria. In addition HLA matching criteria are applied that will determine if that kidney is offered to you in the first place. If after all that you are hungry for more detail then read on here. If you have a kidney transplant that fails, you are usually suitable for another transplant from either a living or deceased donor. Usually living donor kidneys last much longer than dead donors. It is worth noting that if your kidney fails in the first 180 days you will place back on the register with the waiting time the same as when you had your transplant operation. This should mean a shorter wait for a second kidney. For more information on different wait times read this report.